President Yoweri Museveni on Tuesday said that 36 al-Shabaab militants had been killed, while the Islamists claimed in a statement to have killed 59 Ugandan soldiers. 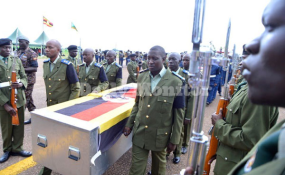 The Uganda People's Defence Forces (UPDF) has lost four of its soldiers during an Easter holiday double attack by the al-shabaab militia in Somalia. According to UPDF spokesperson Brig Richard Karemire, the officers serving as part of the African Mission in Somalia (Amisom) were killed during a double attack on an Amisom military base in Buula Mareer and Golwen in Lower Shabelle region of Somalia. In retaliation, according to UPDF officials, Amison killed over 30 al-shabaab terrorists and eight of their vehicles that included two vehicle born improvised explosives were destroyed. Four PK rifles, two rocket propelled guns, two recoiless guns, one walkie-talkie and 18 sub machine guns were also recovered during the scuffle that ensued. Six UPDF soldiers sustained minor injuries, according to Karemire. However, al-shabaab spokesman Abdul Aziz Abu Musab claims they killed "dozens of Ugandan soldiers." He said the group lost 14 of its fighters during the attack. The Guardian quotes Abdi Nur Hashi, a Somali military colonel stationed near the Ugandan base as saying that up to 46 soldiers were killed. "Most of them were friends. We used to share food and drinks together in their base," he said. "We tried to help our Ugandan friends but there was also a suicide car which attacked our base. Many of the [Ugandan] soldiers died due to lack of emergency evacuation because the terrorists blocked the road," he said. The militants also attacked civilians and razed down buildings. Last year, UPDF lost 12 soldiers in an another al-shabaab attack, which the terrorists claimed had more casualties than the official figures released by government. UPDF remains the biggest troop contributing force to the 22,00 regional peace keeping force in Somalia. Several militant groups still control parts of Somalia. The Amisom forces are expected to hand over security to Somali troops by 2020.